Quench your students' innate thirst for knowledge with a first-of-its-kind laboratory grade microscope that's designed specifically for young eyes, hands and minds. The Magiscope is a powerful scientific tool that works without cords, mirrors or batteries. It has only one moving part and can be used by anyone for anything anywhere -- indoors or out. Best of all, the Magiscope carries an unconditional manufacturer's lifetime guarantee; it's 100% covered no matter what happens to it. No matter what abuse is heaped upon it (excluding vandalism), Brock will repair or replace your Magiscope FREE, for life, no questions asked. So it's no wonder that schools, museums and science/environmental centers across the country rely on the Magiscope. The Magiscope's ingenious Lumarod® system amplifies and focuses ambient light to provide simultaneous reflected and transmitted light that effectively illuminates any object -- transparent or opaque -- without bulbs, batteries, mirrors or prisms. The Magiscope Model #70 - 20x includes a 5x eyepiece plus 4x achromatic objective. 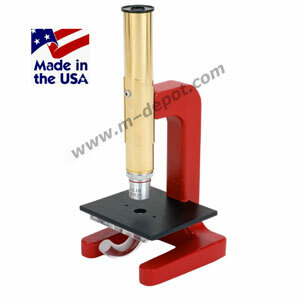 It's made of solid aluminum alloy with brass-on-brass friction focusing and a fine adjustment ramp. It has no exposed threads, knobs, levers, screws, or mechanical adjustments. It features super high eye relief for ease of operation and photographic capabilities. The optional surface adapter enables children to examine large objects and also allows for viewing through aquarium walls. And with Magiscope's unique Micromuseum Exhibit System, specimens can be safely and easily sorted, stored and displayed. Each Micromuseum wheel holds up to eight samples which can be themed to create a specimen library. Alternate configurations and a complete array of accessories provide myriad options for magnification, specimen exhibition and more. The most durable, easy-to-use microscope ever made - and with an incomparable unconditional manufacturer's lifetime warranty - each Magiscope is quality inspected before shipment to ensure total customer satisfaction. Comes in RED or BLACK. Optional accessories available. Shipping dimensions 9.5in. x 4in. x 5-1/4in.